What do Se7en (Korea), Namcha (Thailand), dayDream (Malaysia), Taiwan: Ella (S.H.E. ), Allen Huang, Anthony Neely, SIGMA, Lollipop F, Singapore: Kit Chan, Freshman, Huang Jing Lun, Kewei, Serene Koong, Derrick Hoh, and Lovynn Kan all have in common? - Singapore Entertainment Awards 2011! 《新加坡e乐大赏》(http://sgeawards.omy.sg) celebration concert will be held at the Singapore Indoor Stadium for the first time. This event is organised by Singapore Press Holdings' Chinese media Lianhe Wanbao, Radio 100.3, omy.sg and UW (U-Weekly). OCBC Titanium Card is the presenting sponsor for the event. The objective of the Singapore Entertainment Awards is to support the Chinese entertainment industry that popularises the use of the Chinese language. The awards recognise a spectrum of entertainment ranging from music, movies, TV, radio to concerts. Support the Chinese entertainment industry! When they were at Esplanade Concourse for YFest on 19 Aug 2010 (Thu). They released their album on 9th Sept 2010. They were from 2007's Project Superstar Season 2. So who is your favourite artiste? Who do you think will win this year's OCBC Titanium Superstar Of The Year (OCBC Titanium 年度人气闪耀红星) and Jolly Shandy Dynamic New Generation Artiste (Jolly Shandy 活力四射新生代)? I want to be there to join in the celebrations with my favourite artiste! when: 2nd April 2011 (Saturday), 7pm (Admission from 6pm onwards) where: Singapore Indoor Stadium Ticket Price: $128 (limited stage front standing & seated tickets), $88, $68, $38 (fee subject to GST & SISTIC charges). Get your tickets now at all SISTIC outlets! Photography is allowed, No Video recording and Audio recording is allowed for this event. From 7 Feb 2010 onwards, log on to http://sgeawards.omy.sg/luckydraw/, and key in your unique 13-digit Transaction Number found on your SISTIC Ticket and your contact details to qualify for the lucky draw. Closing date: 3 April 2011, midnight. Draw date: 18 April 2011. Winner will be notified. Remember to keep your SISTIC ticket stub, in case you're the lucky winner of $500 cash prize. Good luck! "Ella & Ambience @ E Awards 2011" uploaded by cloud0807 on Apr 2, 2011. "Forever" (《我爱你爱你爱你》）is a romantic comedy by Singapore director Wee Li Lin. Have you ever experience a moment where you just want to proclaim your love out loud to your loved ones: "我爱你爱你爱你...............!" "I love you, love you, LOVE YOU!" JOEY (Joanna Dong, 董姿彥) got a job as a video consultant at the Wedding Education Department (W.E.D.) . She met GIN (Mo Tzu Yi, 莫子儀) through filming a promotional wedding video for W.E.D., in which they are cast as bride and groom, and called each other "Groomie" and "Bridey". However, things start to change when she becomes delusional into thinking that their love in the W.E.D. video is real. - What would you do if someone you met, stalk you and images an empty relationship with you? In Singapore's context, the W.E.D. mentioned in the movie is similar to Social Development Network (SDN), which was the new name when Social Development Unit (SDU) and Social Development Services (SDS) merged on 28 January 2009. SDU was formed in 1984 to promote marriages among graduate singles, addressing the declining numbers of marriages in Singapore. SDS was set up in 1985 to promote marriages among non-graduate singles. Vision: to facilitate marriages and nurture a culture where singles view marriage as a top life goal. Mission: to establish SDN as a credible, leading agency and one-stop resource centre on relationship skills, social interaction opportunities and information. SDN aims to forge an extensive network of singles, resources and partners and to create an environment conducive for singles to meet and forge meaningful relationships. There are terms like Consumer Price Index (CPI), and Pollutant Standards Index (PSI). In the movie, it has one index, called the "National Wedding Index" (NWI). I like the W.E.D. video, which was shown in the introductory part of the movie. The video shows alternating scenes of the bride and the groom walking and picking up photos of their partner's growing-up years, leading up to them meeting at a romantic spot. This is a great idea for wedding videos shown at typical weddings you see in Singapore, which normally just show collages of their growing-up photos. - How far would you go in your pursuit for love? I strongly think this song should be called: 《我相信》 "I believe"
when: 4 to 6 March 2011 (Friday to Sunday). I know I'm home when I see the crescent and five stars. 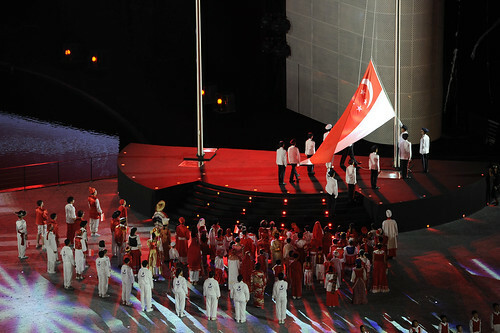 When I saw our country flag flying high at the opening ceremony of the Singapore 2010 Youth Olympic Games (YOG) in August 2010, I felt a sense of pride and joy. When I had a once-in-a-lifetime opportunity to be one of the 2,400 torchbearers for Journey of the Youth Olympic Flame (JYOF) - Singapore leg, I felt this was Our Moment. Let's blaze the trail.... It was a superbly amazing and awesome experience as a torchbearer, with fellow citizens cheering you on. I'm proud that Singapore is the host city for the inaugural YOG. Witnessing Singapore's progress and transformation as I grow up together with this nation. I'm proud of Singapore's achievements and what it is today. And with a mug filled with Tiger Beer, here's a toast to you - Singapore. Yum... seng! I'm proud to be a Singaporean. Thank you Singapore!